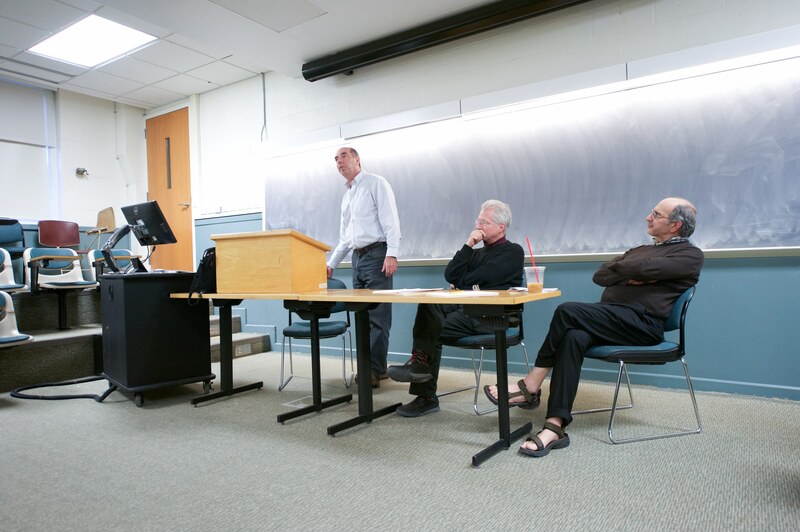 Students, faculty, and community members gathered in PAC 002 on Tuesday, April 5 for a panel lecture called “Zika Virus: Climate and Epidemic in History,” continuing the international discussion surrounding the current outbreak of the disease. Panel participants included Professor of Biology, Environmental Studies, and Integrative Sciences Frederick Cohan; Chair of the Government Department and Professor of Government and Latin American Studies James McGuire; and Professor of History, East Asian Studies, Environmental Studies, and Science in Society Bill Johnston. In the hour-long talk, panelists addressed the political, social, and public health concerns that the Zika virus has been raising since the start of the epidemic in April 2015. After being introduced by Assistant Professor of History, Environmental Studies, and Science in Society Courtney Fullilove, Johnston began the dialogue by providing a brief outline on the history of Zika, its status as an emerging disease, and the way it has evolved to become a global threat. Johnston emphasized the youthfulness of the virus in that the first human cases appeared as late as 1952. Since the virus was so novel, only a very small number of scientific articles could be found about it at the time, and it was only in 2015 that the first PubMed article was published concerning Zika. Following its emergence among humans, there have been three major sites of outbreaks of the disease: Yap Islands in 2007, French Polynesia in 2013-14, and the current outbreak primarily affecting the Americas. It is a mosquito-borne disease carried and transmitted by the Aedes agypti and albopictus species. While the disease is generally minor with no long-term side effects, it has also been associated with microcephaly in newborns with infected mothers as well as the neurological disorder Guillain-Barré syndrome in adults. Cohan then provided epidemiological information regarding Zika, which he often mentions to his students in his course, BIOL171: Global Change and Infectious Disease. Cohan stressed that between 1952 and 2007, only 14 known cases of Zika were reported, highlighting the extremely dynamic nature of the virus and its ability to adapt to a changing world. Cohan explained the danger that mosquito-borne viruses possess that allow them to become more virulent over time. Specializing in public health systems of Latin American countries, McGuire was then able to put the outbreak into a political and social context, showing how affected nations may or may not be prepared to deal with Zika. McGuire also emphasized the importance of eliminating mosquito breeding sites while simultaneously educating people on how to avoid being bitten. Though Brazil is hindered by an economic crisis, the burden of a maturing public pension system, a scandal in the state oil company, and political turmoil, it has a long history of disease control initiatives and good data on disease and history of public health research and experimentation. Fullilove explained the importance of having an interdisciplinary discussion regarding the virus as it gains relevance worldwide. She added that today, there is an increased level of significance that must be placed on the effect of a globalized world.